I saw today that Stephen Mitchelmore has tweeted about a possible publication of an English translation of Celan’s Collected Posthumous Prose. The book, a thick, dense tome, is indeed wondrous, some of it in French, some in German, some in Romanian. The translator is Pierre Joris. The connection of Joris here is interesting, I find, and I want to say a word or two about Celan, his friends and his published correspondence. 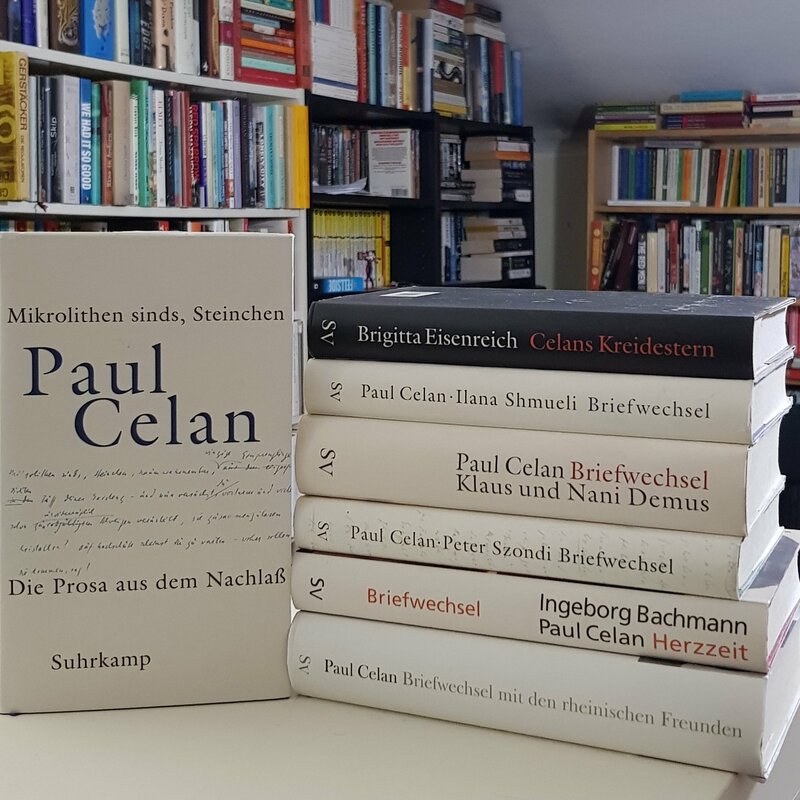 There are so many volumes now of Celan’s correspondence (the only one I’m lacking is the one with his wife, because it is an expensive French “coffret” – and I assume the German version, though much cheaper, is translated and what would be the point of that) – but they all – every single one – have the same shape. Celan meets people with kindness, sadness and enthusiasm. He’s clearly difficult, but an extraordinary and intense person. Then, mid- to late career, fatigue sets in. Everything starts when Yvan Goll’s widow – Claire Goll – starts a public campaign that smears Celan as a plagiarist of her husband’s work. It is enormously untrue, but damages Celan immensely. And it’s not just the publicity and Goll’s loud attacks – there’s also the dubious reaction from his friends. German critics, then as now, have a complicated relationship to Jewish literature. Henryk Broder has defined it as the difference between dead and living Jews: Germans feel guilty about dead Jews – but they will leap at the opportunity to attack living Jews. As a survivor of the Shoah, Celan straddled the line. When he entered German cultural life, his biography, in connection with his astonishing work, insulated him, gave him praise, protection and a certain status in German culture. But the Goll Affair exposed how precarious his situation was. Celan felt under attack – as a person, as a poet, as a Jew. And suddenly he found himself among Germans. Barbara Wiedemann’s valuable edition of documents around the Goll Affair show that the most engaged of his friends were Jews themselves, like Peter Szondi (a brilliant philologist and survivor of Bergen‐Belsen, who drowned himself a mere year after Celan’s departure, and 7 years before Améry’s ‘suicide, another survivor of the Shoah). If you look at the letters, you can see the exact point where Celan turns to suspicion. It hams his relationship with Bachmann, whose sometime-lover Max Frisch had no empathy or understanding for someone not as securely ensconced in a country and culture as Frisch was, and it ends several others. Surrounded by Germans, Celan sees how tenuous his sense of home and security is. Like Peter Szondi, he looks towards Israel as a home. There is very little in his work that comments on Israel, but several passages in the collected prose refer to Israel. In his poem “Denk Dir,” written during the 1967 Arab–Israeli War, he describes Israel as “dies wieder / ins Leben empor-/ gelittene / Stück / bewohnbarer Erde.” (~ “This piece of land, suffered up into existence”). Like Szondi, he never moved there. Szondi’s motivations for not doing so may mirror Celan’s – Szondi writes in a letter to Gershon Scholem that he felt “at home” for the first time in Israel and that it was “unbearable,” this feeling. He was no longer able to be comfortable, after 40 years of alienation, genocide, and then living among the people who engineered that genocide. Celan’s relationship with Israel was certainly extraordinarily complicated, but he was clearly, unequivocally, a defender of the Jewish homeland. Now, to get back to the English translation of the Collected Posthumous Prose. Pierre Joris is, in many ways, a typical representative of the Anglo-saxon left when it comes to Israel. His focus is on Palestine, and he is vocally, loudly, pro-BDS, a virulently antisemitic movement. To see his name next to Celan’s work gives me the shivers, but somehow, it feels fitting. Celan grew to be suspicious of many of his friends, aware that their relationship to the – for him, existential – questions of Jewishness, security, home, was different from his. Joris seems not atypical among his friends. Celan – like Améry, like Szondi – was ultimately dependent on the language of those who, a few years earlier, wanted to murder him and his family, he was dependent on structures partially built by murderers and lived subject to laws carried out by former murderers. The chancellor of Germany in the last years of his life was a former Nazi party member. Living in the language of Germans and among Germans, building a sense of home and language, informed much of his work. It is cruelly fitting that even in translation, he is dependent on the language of people with antisemitic sympathies. That does make me shiver a little. After the blow to any last shreds of Romanian national pride I might have had after reading Mihail Sebastian’s cruel realisation of the betrayal by his Romanian friends like Eliade and Cioran, I’m not sure I quite feel up to reading about the betrayal of Celan. I’ve been reading nonfiction studies recently about the way Jews fared in Romania and it is chilling.